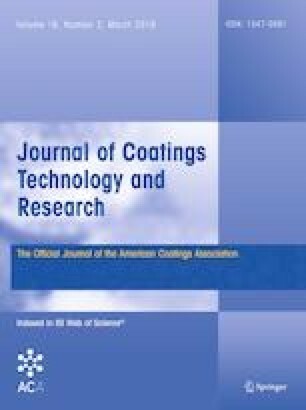 The aim of this article is to demonstrate a new way of measuring and understanding the appearance of pigment flake orientation and texture in special effect pigments for use in industrial coatings. We have used diffractive pigments and analyzed the relative orientation of the particles in the coating layers by evaluating their behavior in two common industry applications: solventborne and powder coatings. We have measured the interference color by taking readings with a high-resolution gonioreflectometer, in order to test the viability of automatic diffractive pigment evaluation. The results were analyzed using both psychophysical (i.e., human) and computational (i.e., mechanical) methods. Our later psychophysical and computational analysis of the visual differences that diffractive pigments present in both solventborne (1) and powder coating (2) systems for in-plane and out-of-plane geometries revealed that solventborne liquid paint systems better preserve the appearance of original diffraction gratings. This is due to enhanced orientation of the anisotropic pigment particles. The powder coating surfaces investigated, on the other hand, preserved higher intensity and thus visibility in randomly oriented solitary flakes, creating a greater sparkle contrast. We confirmed our findings by capturing and visualizing coating appearance by means of a bidirectional texture function. We then compared the diffractive pigment evaluation results with other state-of-the-art measuring device readings. We believe that our work provides valuable information on flake orientation and also compares pigment performance in a range of industrial coating systems, which may enable industrial companies to improve paint spraying processes. The authors would like to thank the Schlenk Metallic Pigments team for sample preparation and Dr. Ralf Webler at Schlenk for the SEM analytical support. This research has been supported by the Czech Science Foundation Grant GA17-18407S.